Brian and I went to see Ponyo the other day. It was gorgeous and lushly animated, and for someone like me who loves the sea, the first sequence was just a delight, with the jellyfish and spider crabs and all. Just in terms of the setting and visuals, it’s easily my favorite Ghibli movie, and I’d love to see it again just for how pretty and filled with life everything was. I enjoyed the story, too: Ponyo and Sōsuke really seemed like actual kids and they were so much fun to watch, and if none of the characters were really tremendously deep, they were sympathetic and sweet. All the little details really made the movie special: the octopus trying to figure out a sliding glass door, the sprinkler system Fujimoto used on land, the way Lisa presented the ramen to the kids. The story is a loose adaptation of the Little Mermaid, and if you’re the kind of person who likes this paperdoll blog I bet you’ll enjoy the movie too, so go see it! For an actual review, try Ebert’s review of it or the Star Crossed Anime Blog review. It reminded me most of Spirited Away, but somehow not as coherent: things that seemed to have a lot of significance were too casually introduced and dropped. Granmammare and Fujimoto were humans, then gods and protectors of the seas, and somehow produced thousands of magic goldfish children, the moon itself drops out of orbit and pulls all the water towards it, and a five-year old’s pledge of love is enough to set the world back right, despite the fact that the environmental changes must have caused horrendous damages and losses of life. (If the moon was essentially making the highest high tide ever, I couldn’t help but wonder what the low tide elsewhere was looking like…) These things felt to me like they were trying to cram some depth and mythology in; things like boys who are also both rivers and dragons worked in Spirited Away both because it was established as a whole different world and because it had a more mature feel to it, but Ponyo seemed to bounce between being light-hearted and solemn. It also seems to me that Ponyo herself is on track to becoming one of those tedious anime females who attaches herself like a millstone to the neck of the male lead character, happy to be entirely without her own goals or thoughts as long as he’s around. Ugh, about the only one of those I’ve ever liked is Misa from Death Note. Well, I like to think that it doesn’t happen quite that way and that she finds joy as a human in addition to Sōsuke’s existence… These are all really just minor quibbles, though — things that weren’t addressed in the movie that bugged me. I still loved it anyways! 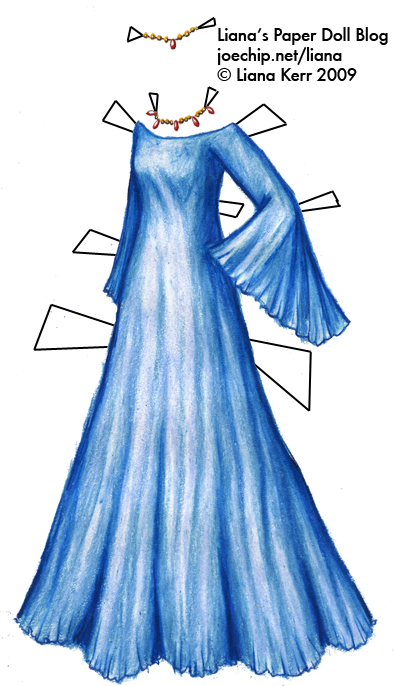 This dress is an adaptation of Granmammare’s blue gown – it’s just flat blue in the movie, but of course that’s not quite so much fun for me. Anyways, it changes shape a few times in the movie, so I like to think it can be pretty much whatever she pleases. I like all of the Ghibli movies, but in general I prefer the ones that skew a little bit older – Only Yesterday and Princess Mononoke over Ponyo and My Neighbor Totoro, for example. I can’t choose between Porco Rosso and and Whisper of the Heart, so they will both be my favorites. Cool! I love this dress! I have never seen that movie before…. from what you said, Liana, it must be good though! i am glad you are back on!! I’m a sucker for all the Ghibli movies, but it really is good! Not my favorite, but good :) Glad you like it! I love a Ghibli movies!!! Ponyo was my least favorite cuz the mom acted like a little kid when she was signaling the dad.